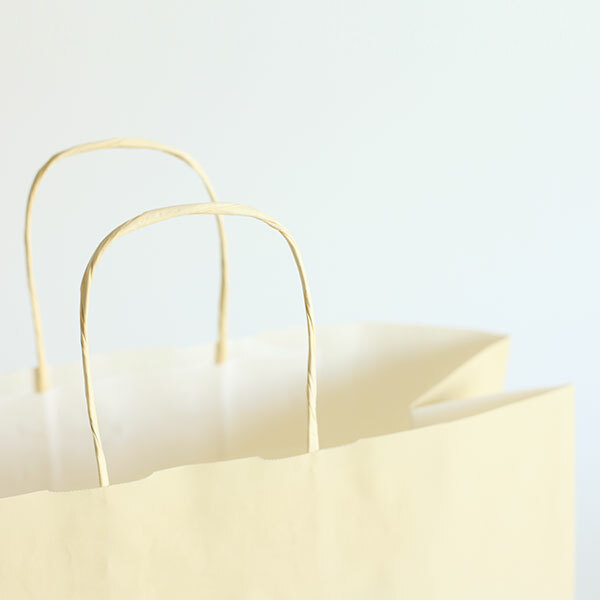 Our gorgeous Italian Ivory Coloured Paper Carrier Bags with Twisted Paper Handles. 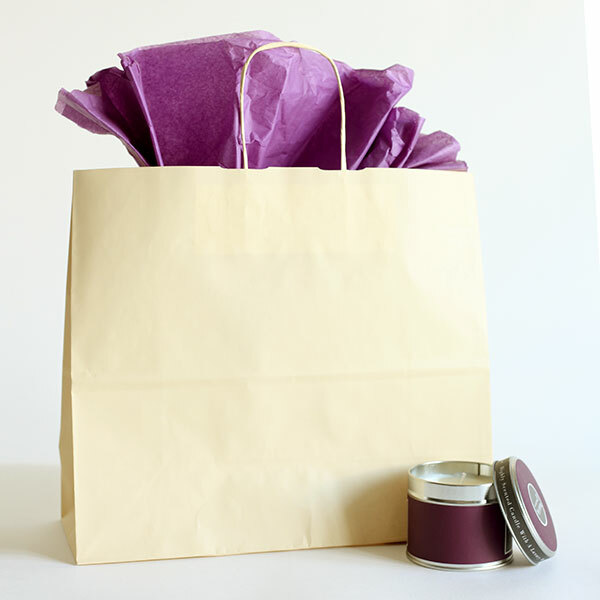 These are strong bags ideal for many uses, a perfect alternative to plastic bags! New Bulk Buy packs of 1,000 or more bags for even bigger discounts! Please note that all sizes and quantities are approximate. Image is for illustrative purposes only. If colour is important please ask for a sample. These quality carrier bags are manufactured in Italy. These bags are commonly used in Retail stores, Gift stores, Boutiques and Clothing outlets.Flat block bottom suited for boxes and other containers, the bags are suitable to hold up to 2 kilos in weight. 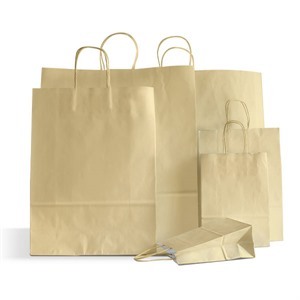 Our stock of Twist Handled Paper Carrier Bags are our most popular range of Paper Bags, we are able to overprint them with your chosen design. A simple 1 colour print from as little as 500 bags. 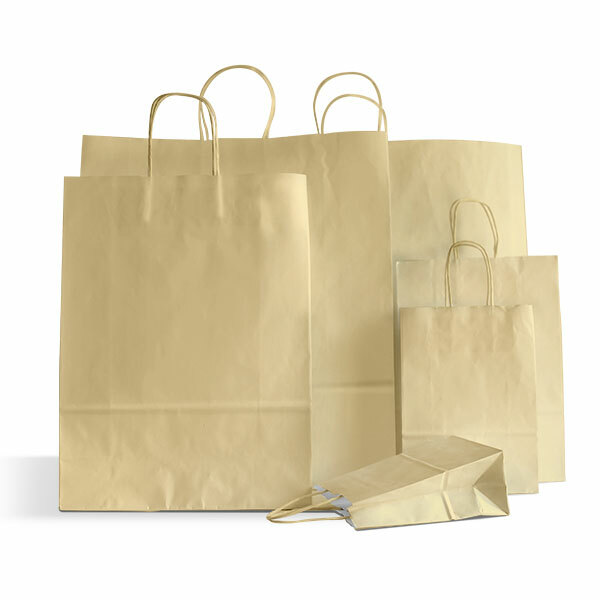 If you require something a little more complex or require over 1000 bags, we can have the bags printed using a full printing press. If you need a special size we can even have the bags hand made in Europe to your specification. Simply fill in our Quote Request From or Call Us on 020-3002-9960 and we will get you a free No Obligation Quotation. How to earn loyalty points! Purchase: Every item bought on CarrierBagShop.co.uk will earn you points to the value of 1 point per full pound spent. Prizes: Win points in competitions promoted on our website, via social media or on our email list. We're Raising Our Delivery Standards! Simply order over £49 & get Free Next Day Delivery to selected UK mainland addresses. We have now committed to our Free Next Day Delivery service for all orders placed with a total goods value of above £49 (ex. VAT). It applies to selected mainland UK addresses, usually covering England, Wales and some Scottish address. Qualifying address will show the option at the checkout stage and be determined by our delivery partners. Who will be delivering my goods? All orders are normally sent using a "signed-for" courier service (Fedex/UK Mail). In certain circumstances we will also use a palletised delivery service depending on the size and weight of the products that you order (if goods are sent by pallet, the driver is not obliged to help unload the goods, however if you ask nicely, most are willing to help!). If your order is to be delivered by any method other than the methods previously mentioned, you will be notified before it is dispatched. When will my goods arrive? Next Day Delivery means that goods will be dispatched same day if ordered before 3pm and next working days though it is possible that the goods may arrive earlier. If you are not able to accept delivery within this time frame, please call our helpline on 020-3002-9960 to arrange an alternative delivery schedule. Any orders placed over the weekend will be processed on Monday (assuming it's not a Bank Holiday) and be treated as if they were placed on that day. Got a question or need help? Call us on 020-3002-9960 and we'll be happy to assist you. Have you found this product cheaper elsewhere? Let us know by calling 020-3002-9960 and we'll match any like-for-like price that you find. We review our prices regularly as well as trawling through the internet looking at other prices, to make sure you're getting the best deal possible. From time to time however we aren't, and we'll happily match those prices! All you have to do is call our Customer Experience team on 020-3002-9960 and quote the website where you have seen the price, and they will then apply any discounts. The price has to include all charges, including delivery costs and so on. When sourcing products we always focus on quality over price or quantity, and strive only to provide the best products. There are instances where we won't be able to price match products that appear to be the same but in reality are not. However, in this instance we will do everything we can to help. We hate unexpectedly running out, but here's something we think will help. If you can wait a very short while whilst we get new stock in for this product, then we'll happily give you 200 Extra Loyalty Points if you order when it comes back in! All we need to redeem this offer is for you to call us on 020-3002-9960 and speak to our Customer Experience team who will be happy to help you. They will check when the product is due back in, give you an estimated delivery date and call you to process your order when the goods do arrive - and then of course add the additional points onto your account. Alternatively, simply e-mail us to enquiries@carrierbagshop.co.uk with your contact phone number and we'll call you to make a note of what you would like! If you can't wait - please still do call us on 020-3002-9960 and we'll do everything in our power to find you an alternative solution!